An Altruistic Angle: Win a year in America! I recently went to the “United States of America Green Card Lottery” website and thought I’d been given a chance to go on vacation in Hawaii (free airfare included!). Flashing red arrows encouraged people to register with a heading that read: “Live & Work in USA!” Of course they have to start with the Eligibility Test and reapply every year (though they disguise it by saying “renew” it). What they do tell, in the fine print, is that only 55,000 people get Green Cards each year. That’s less than the capacity of Dodger Stadium in LA, where a large percentage of these immigrants will live (LA, not Dodger Stadium). However, they do not tell what the chance of “winning” is, but only state that the applicant will have 0 percent chance of winning if his/her forms are incomplete. (The chance of winning is .6 percent). Don’t get me wrong, there are other ways to get to America: workers visa (only available based on the United States’ need for workers), EB2 visas (for those with advanced degrees in specific fields) and various other visa options. 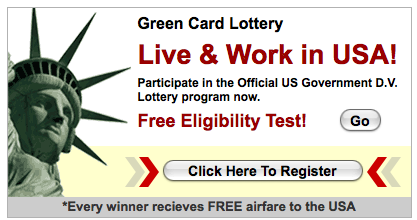 These however work in the same lottery way as the Green Card system. It’s the propaganda that is most disturbing. How we continue to impose our values and consumer system on other people because it has worked for us. How can we diversify without being honest? These immigrants will most likely end up in a Dunkin’ Donuts or on the side of a hill working for a ski resort making five bucks an hour and living with 10 other immigrants, not experiencing the culture or making enough to live on, let alone provide for any family they left in their home country. Obviously if we opened our doors and accepted all the applicants, we’d never sustain them. So we’ll resolve to stretch our democratic borders into other countries and cultures, whether it invites us or not.